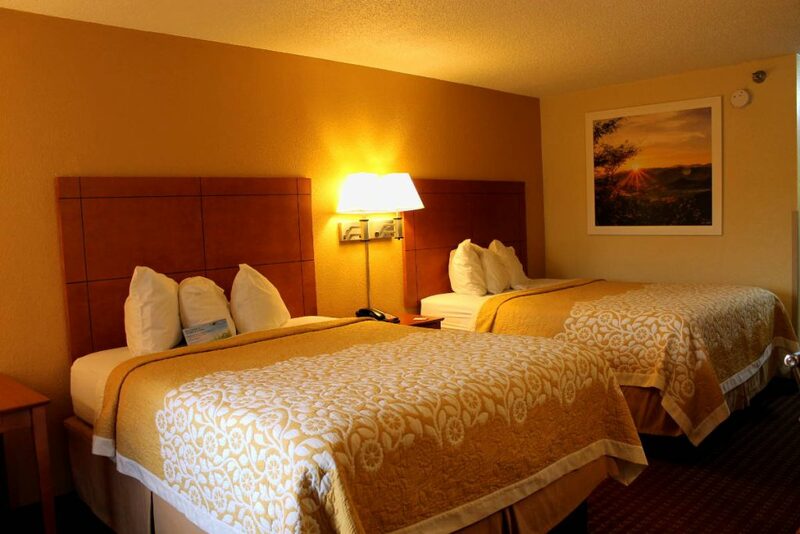 In the end, my mom and I chose to stay at Days Inn Airport Nashville East because it was a 15-20 minute drive to a majority of the attractions we wanted to visit. More importantly for us, it was pretty cheap. While we were satisfied with our hotel choice, I’m not sure I would stay there again. It was the first time I had stayed in a motel, and learned that the style just wasn’t to my liking. In a motel, there are no interior hallways and all the rooms can be accessed directly from the parking lot. That idea just made me uncomfortable, regardless of how nice the neighborhood was. 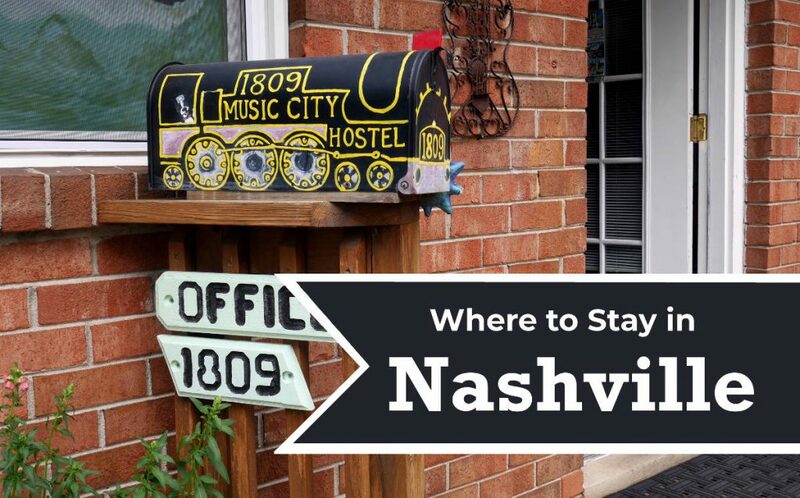 If you are like me and aren’t a fan of motel’s, you can just keep scrolling and find plenty of other great places to stay in Nashville below. However, if you don’t mind motels, it’s not a bad place to stay. It was relatively clean (although you could see a decent amount of dust built up in places like above the door frame and around the outlets) and they offer continental breakfast. 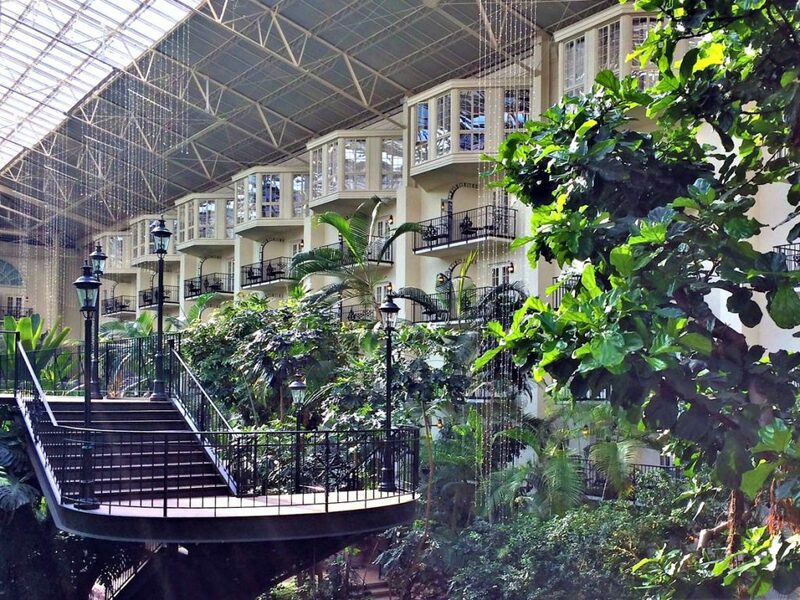 There’s so much to do at the Gaylord Opryland Resort, you may not even leave to go tour Nashville! That would be silly, of course… but with more than a dozen food options, a unique conservatory-style atrium, and the Grand Ole Opry just across the street, the resort offers a great taste of what Nashville has to offer. Bonus: it’s crazy Instagrammable! From the minute we arrived, we marveled at the beautiful displays in the glass atrium. Giant musical instruments hanging over 9 acres of indoor gardens, thousands of fairy lights dropping from the 5-story ceilings, and a “river” running through it all. Yes, a river. We made the most of our time there, eating at several of the hotel’s restaurants, exploring the gardens for a few hours, and taking the Delta Riverboat Tour through the atrium. Yes, a boat tour! If you go, enjoy a drink and some small plates at Findley’s Pub (we indulged more than once!) and take time to check out the exhibits throughout the atrium. It goes without saying that the boat tour is a can’t-miss, especially if you have kids. I mean, how many people can say they took a boat through a hotel?? If you’re planning a visit to the Music City, the temptation might be to stay at one of the standard big-name chain hotels, but there are better options. Nashville is a city steeped in history, with charm, and life, and you’ll want to stay in a place that serves as a direct conduit to that energy that the city is known for. There are two options you should consider – one for each end of budget ranges. First is the classic and historic Hermitage Hotel, located on 6th Ave. North in downtown Nashville. This beaux arts hotel was build in 1908, and has hosted historical figures ranging from celebrities to Presidents – with Kennedy, Nixon, and Wilson among them. It’s a beautifully ornate building, with four-star cuisine onsite and white-glove service that makes you feel like you’ve gone back in time – all for under $300 per night. If you’re looking for a more budget sensitive option that is uniquely tied into the southern hospitality and charisma of Nashville, look for accommodations at the The Big Bungalow. This historic home in East Nashville rests in a community of thriving new gastropubs and restaurants, and whose owner specializes in providing entertainment for her guests – including hosting jam sessions for local musicians (she is also a musician herself) and pot-luck dinners. Cozy and comfortable, you’ll wake in the morning with a fresh south breakfast just the way you like it. 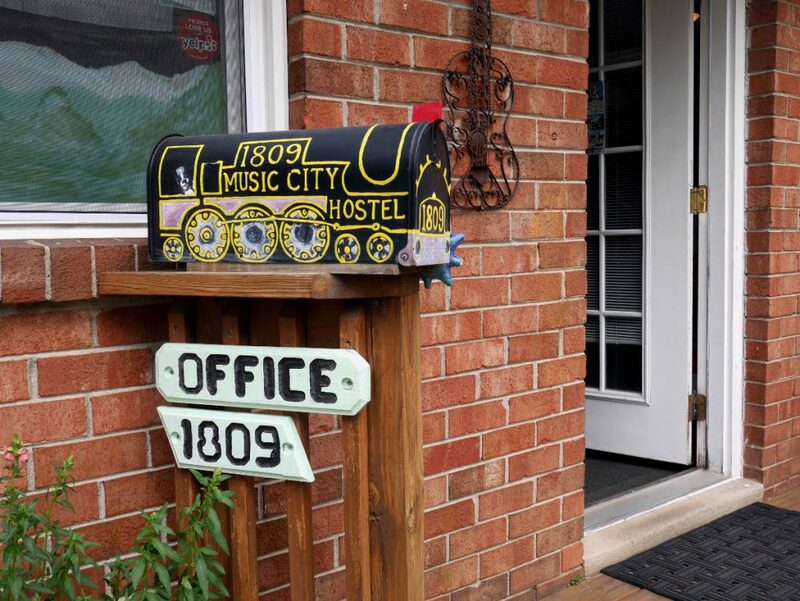 Music City Hostel is a great place if you are going to Nashville solo or if you are trying to save money. It is a great budget option. The rooms are clean and each building has a large common room. Every building is decorated with hand painted pictures and it has a real laid back, hippy vibe. It is only a 15 minute walk to the downtown area. It is great in nice weather because they provide outdoor BBQ areas. I stayed for two nights in Nashville but I was really happy with my choice.I brought a car, as I was on a road trip, but I never used it when in the city, I was able to go out partying on Broadway each night and when we wanted food or to do anything we just walked. It was perfect. 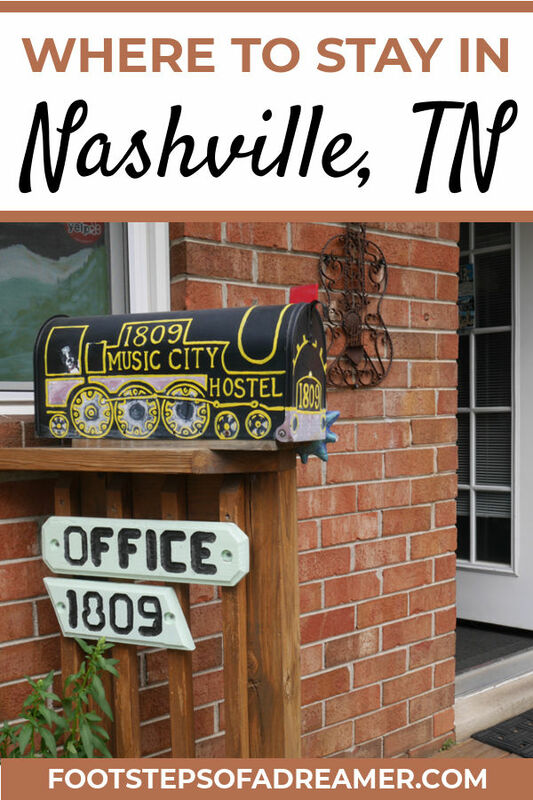 Last year I was headed from Chicago to Huntsville, AL for a blogger convention so I was looking for some interesting stops along the way and Nashville was an obvious choice for a long weekend. As I was taking the bus from city to city, I would be arriving and departing the downtown area, so it was natural to look for something near the bus stations and main sites. The Nashville downtown also has the highest concentration of activities – from bus tours, the hockey arena, Ryman Theater, Country Music Hall of fame, and all the Honkytonks on Broadway. The Nashville Downtown hostel is only a few blocks from all the places, on a quiet street near the river. You can’t beat the price, especially if you’re a solo traveler. There’s a great room for socializing, and a good kitchen with one refrigerator dedicated only to chilling beer! It was great to stroll over to the restaurants and music venues and not have to worry about transportation to get home. If you’re looking for a place to stay on a weekend trip to Nashville there’s no better place than SoBro Guest House. This hotel is located in the downtown area of Nashville, not far from thriving honky tonks and delicious BBQ joints along Broadway. It’s also walking distance to several of the most important Nashville attractions, such as the Johnny Cash Museum and the Country Music Hall of Fame, both of which shouldn’t be missed on your trip. 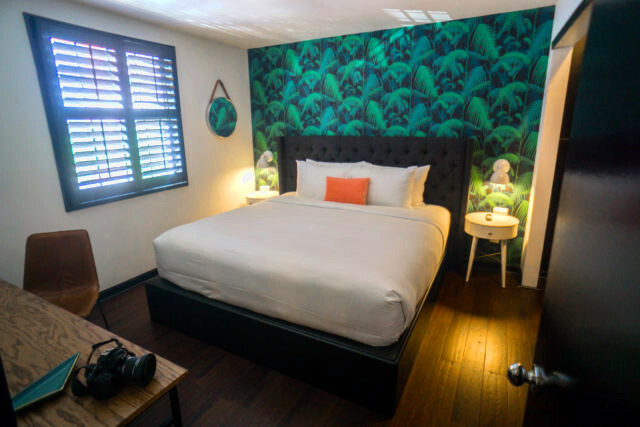 SoBro Guest House has apartment-style accommodations with the ability to check yourself in seamlessly upon arrival with a simple key code that you are mailed upon check in – it’s like a stress-free version of Airbnb. The apartments are massive and the interior décor is super cool, with funky green leaf-print wallpaper and cool details like a working record player and a few records you can listen to. And if you feel like cooking in, there is a massive kitchen in the apartment – though I wouldn’t blame you if you went out and tasted Nashville’s amazing food scene instead! We loved our stay in the Historic Edgefield area in Nashville, Tennessee. For our couples getaway, we decided to fly to Nashville to have some adult fun and eat great Southern food. 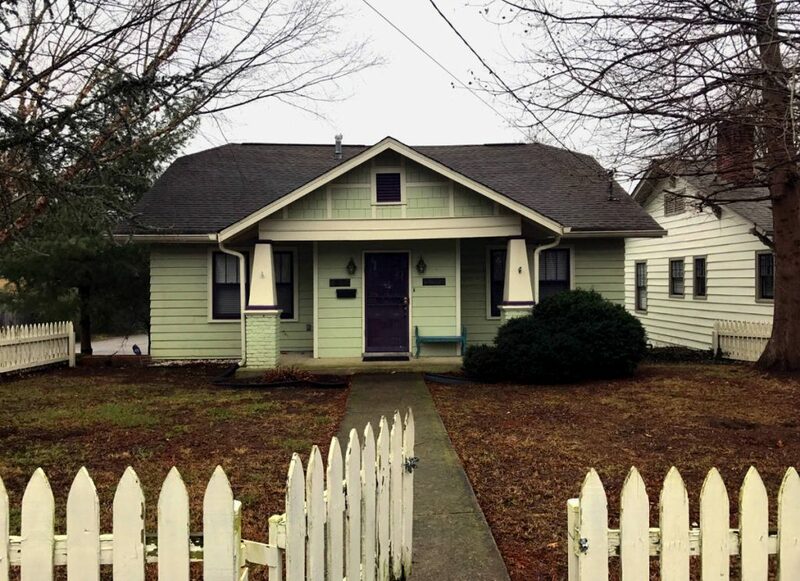 We decided to stay in a local neighborhood close to downtown and chose Edgefield due to its’ proximity, availability on a long weekend, and restaurants within walking distance. We rented a two bedroom Airbnb which was perfect for the 4 of us. We walked to a coffee shop for breakfast and had a delicious lunch at Pharmacy Burger 10 minutes away. The downtown area, with all the sights, was a quick 7-minute drive. We felt removed from the nightlife, yet close enough to visit if when wanted. Although we did not eat dinner in the area, there were plenty of highly rated options nearby. Overall, I highly recommend staying in the Historic Edgefield neighborhood if you want a local scene, proximity to downtown and some great food in a walkable area. Find more options for where to stay in Nashville on booking.com! Previous story What to Pack for Nashville – Are You Ready for Music City?